View cart “Read & Spell Game 7 – The Shipwreck Fishpond (PC version)” has been added to your cart. This is the most important game to cover, especially for children who have never been exposed to the Zoo-phonics curriculum. 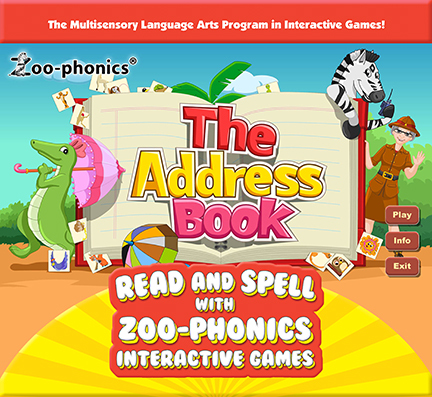 It is in Zoophonia’s Address Book where children discover all 26 lowercase letters (our cute Animals, their Alliterative Names, shapes, sounds and Body Signals). The Animal Letters are introduced in order of the alphabet from “a – z.” Our Animals will become familiar friends and will lead to letter shape and sound recognition. Zeke Zebra gives directions, and Zoophonia immediately starts Signaling the Animal Letters as our “Come Meet Us at the Zoo” song plays! First, take a look at the details in the screen. There is so much for children to do here. This is going to be a kid-favorite, we promise. However, it does a lot more than provide a fun coloring game. It is actually going to teach children the shapes and sounds of the lowercase alphabet! Children will enter into the Zoo and instantly meet Zoophonia, Allie Alligator and Zeke Zebra (representing “a – z”). NOTE: To hear “Come Meet Us at the Zoo” and see Zoophonia Signal the whole alphabet, click on the Musical Note Flags on the Flagpole. Encourage children to Signal and sing along for memory! Click on Allie Alligator or one of the Animals at the bottom of the address book to display it on the screen. You will see and hear Zeke Zebra give a “rap” (rhyming couplet) from the “Jump Rope Rap” for that specific Animal (have children memorize and recite the Raps) and watch the Animal “morph” from Animal, to letter, and back to Animal as Zoophonics Signals and sounds the letter’s sound. Encourage the children to Signal and sound with her! It is time to color the Animals! Click on the Umbrella Color Palette to choose the colors. The child needs to look at the Animal in the box as a model because the game requires precise color choices. If the color is not correct, it will not release the color. Some Animals will require up to 3 or 4 colors (e.g., Allie Alligator, Olive Octopus, Missy Mouse, etc.). Both Zeke and Zoophonia will give the children compliments on a job well done. Once the picture is colored, the child can then click onto another Animal to color. Children cannot color until Zoophonia has “Signaled and sounded” the letter. Encourage children to Signal and sound with her. To exit the game, click on the “Zoo Sign” and it will instantly take you to the Home Page where all the other games are located. learn two songs to aid in memorization and letter reinforcement.